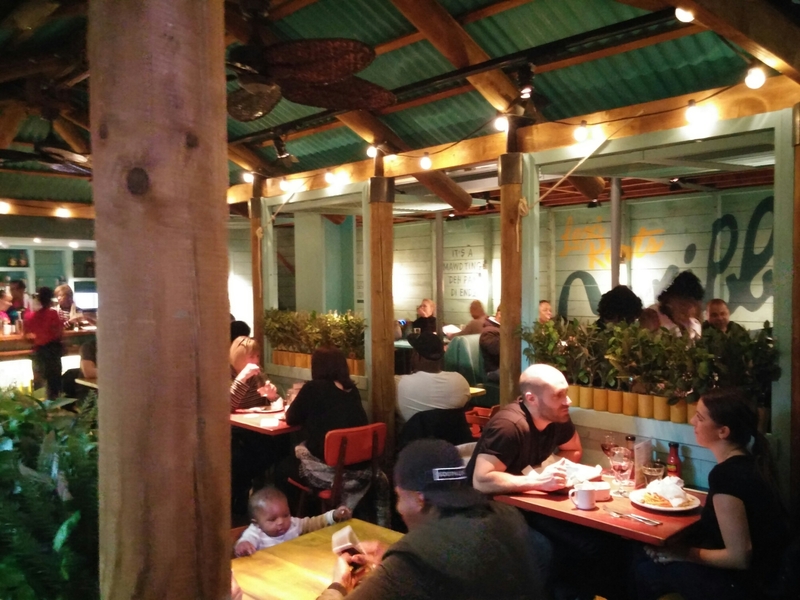 Levi Roots, creator of Reggae Reggae sauce, who rose to fame following his memorable appearance on Dragon’s Den, has opened his first Caribbean “Rasta’urant” in London’s Westfield Stratford, together with Las Iguanas co-founder Eren Ali. 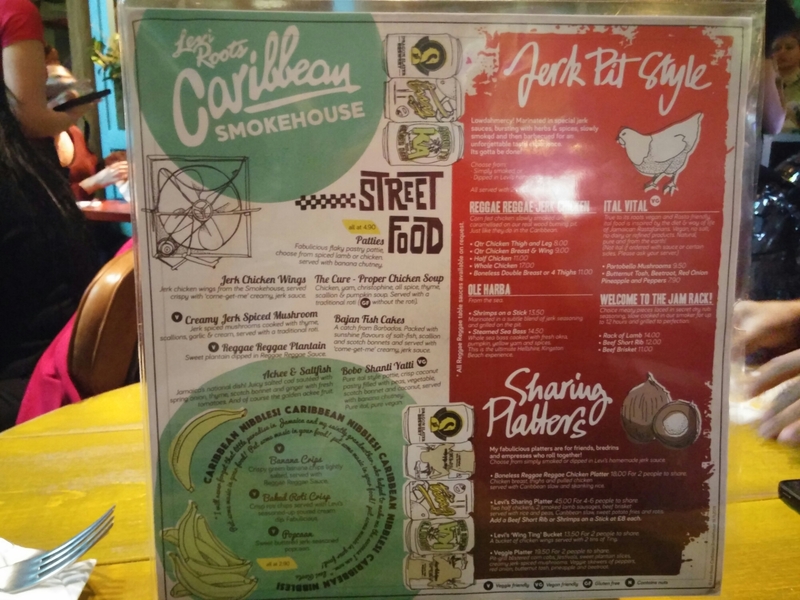 Caribbean Smokehouse, opens on the back of the success of the multi million pound Levi Roots brand. It is centred around the tagline “put some music in your food” to bring a touch of the Jamaican paradise and sunshine to the shores of London. 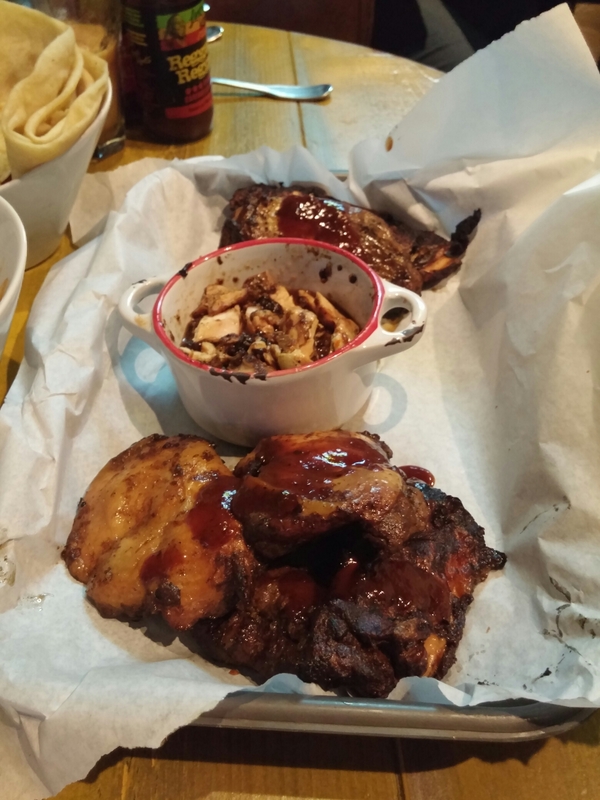 Levi Roots’ passion to bring authentic Caribbean food that tastes and smells like you are in Jamaica is exactly what the East End of London has been missing, until now. The interior exudes a hip and funky atmosphere with a chilled out communal vibe to it. The whole place has the rhythm and soul of a Jamaican beach hut, with tropical colours, miniature palm trees, wooden interior, corrugated iron, and walls that sing back to you that you’ll want to buy a one way ticket to Jamaica. The “put some music in your food” theme continues through to the menu which is full of Roots’ character, although, can get confusing when deciding what you want to order. Maybe more so because there was so much choice we didn’t know where to begin, and everything sounded good. The menu caters for so many dietary requirements, whilst remaining true to its Caribbean roots with Jamaican spices and herbs running through its menu, not to mention Levi Roots’ Reggae Reggae sauce which has now become a household condiment. Whether you are a carnivorous meat lover, Vegetarian or Rastafarian, Levi Roots hasn’t left anyone out. 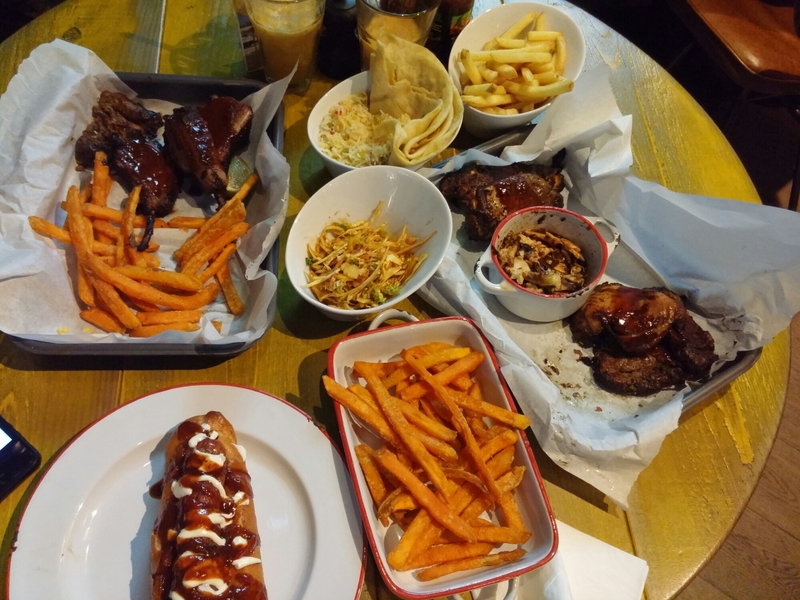 Our invitation to Caribbean Smokehouse started off with sampling the “Jerk Chicken Sharing Platter” for two; how could you not order Jerk Chicken, right? The platter consisted of halal corn fed, free range chicken which had been triple cooked. The chicken thigh was deliciously moist and flavoursome with the perfectly seasoned crispy skin adding a contrasting texture against the moist thigh meat. With its higher fat and collagen content, allowing it to withstand higher cooking temperatures without drying out, you have the advantages of it being boneless like breast meat but packed full of flavour you can only achieve with an ‘on the bone chicken’ that no wonder it was a gustatory revelation for us. Once you go thigh, you’ll forget about breast all together! We are not huge fans of chicken breast as it lacks the flavour of dark chicken meat, and as such the chicken breast was our least favourite. Due to its naturally lower fat content compared to thigh meat, the chicken breast wasn’t able to achieve the same level of gustatory delight as its thigh rival. The breast meat was sadly dry and underwhelming. Our recommendation would be to replace the chicken breast with leg pieces. At a cost of £18, we thought it was pricey in relation to the portion of meat you get. The Rack of Lamb was dry rubbed, smoked for almost 12hrs and then finished off on the grill, and topped with a generous serving of homemade jerk sauce. Big, fat, juicy pieces of lamb cutlets were presented to us which were so succulent you don’t need teeth to bite through it. The meat was smokey, superbly rich and full of fat which added signifcant depth of flavour. 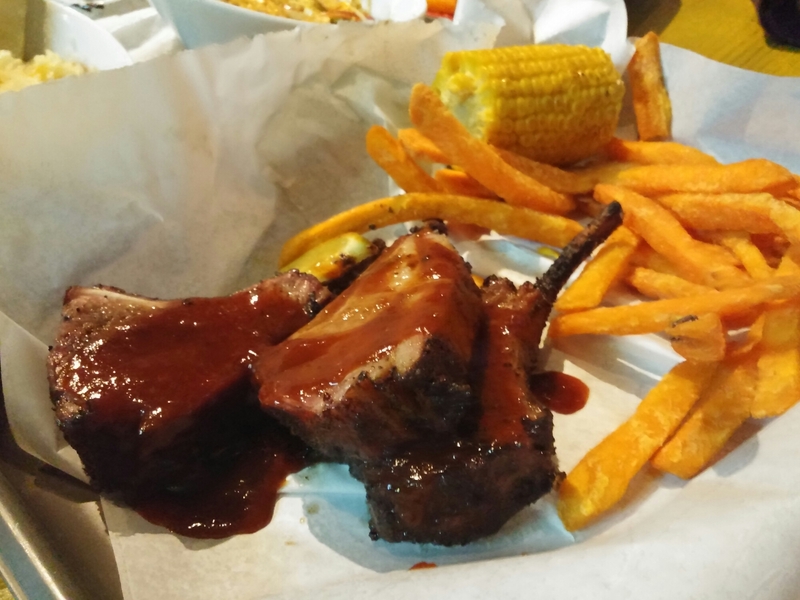 The jerk sauce brought a hint of chilli to the tastebuds and the collective taste of each component transformed the rack of lambs to a whole new height of culinary delight. However, at a price of £14 we were expecting maybe 5 pieces of lamb cutlet. The accompanied sweet potato fries were delicous. Moist and sweet on the inside and beautifully crispy on the outside with subtle seasoning. The normal fries on the other hand didn’t quite compare to its sweet potato rival and was marginally undercooked. The Jerk-Pit Lamb Sausage Hot Dog was…Lowdhamercy… Smoking hot. A big fat flavoursome and wholesome jerk-pit sausage meat was presented in a buttery brioche roll, and topped with a generous serving of reggae reggae pepper relish, hot mustard and lime mayonnaise. Just reading this out loud is making our mouth salivate with nostalgia. 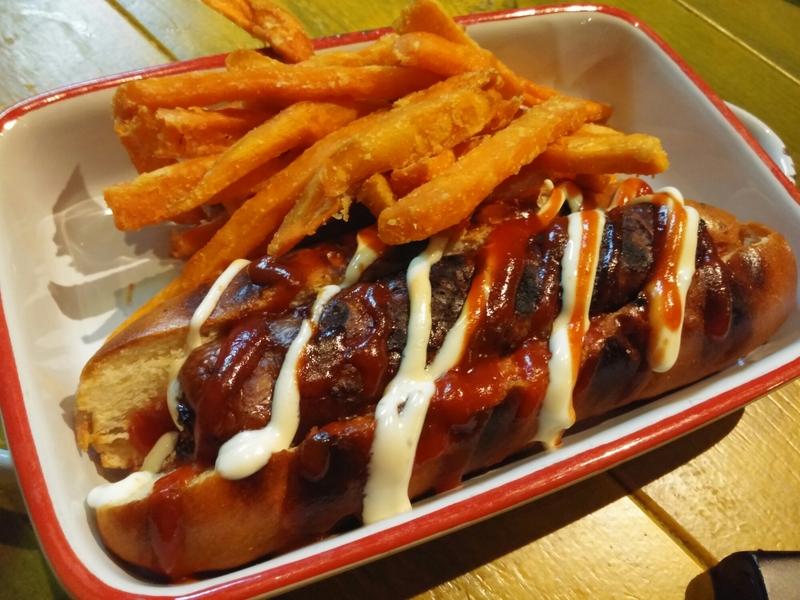 The sausage had the same smokey taste running through it as the chicken and lamb cutlets with a hint of chilli, that really transformed the humble hot dog to a “Reggae Reggae Hot Hot Dog”… It was so good we had to name it twice too!! The Caribbean Roti was an absolute delight. Filled with ground split peas, it was flavourful, flourful and fluffy. Yes a bit of a tongue twister, but it really was good that it left us dreaming of sitting on the beach in Jamaican eating roti stuffed with meat and soaking in the sunshine. The Skankin Rice with ginger, peas and pumpkin was subtle in flavour but we really enjoyed it. It almost tasted like mamas homemade Indian pilau rice with ghee, and sure enough it brought back childhood memories. For drinks we ordered the Summer Twister and Caribbean Punch, both from the smoothie section. We absolutely loved the Caribbean Punch. The Summer Twister on the other hand tasted a bit like watered down pineapple with lots of crushed ice. The Caribbean lemonade was also fairly mediocre. 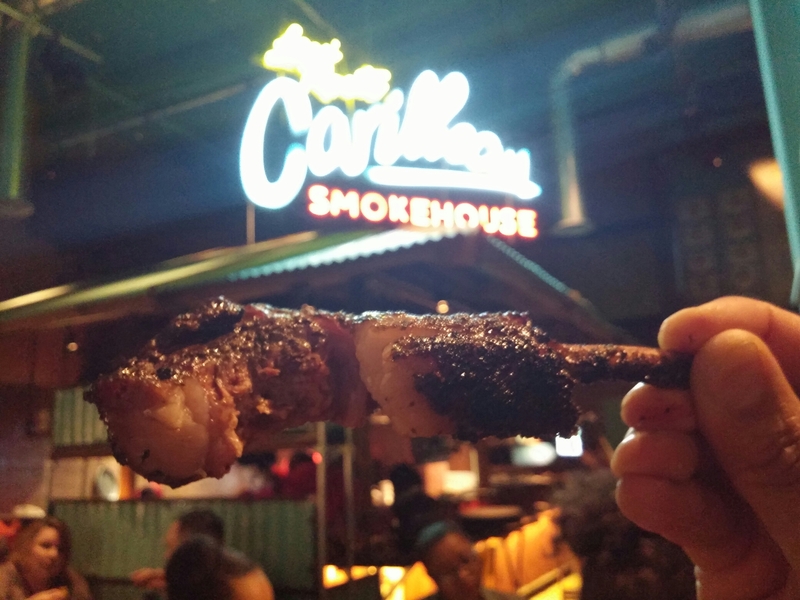 Caribbean Smokehouse brings authentic Caribbean food to the mainstream market. As the man himself says “this is all about fulling your belly with the most deliciously gorgeous flavours dripping with my secret sauces straight from the burning wood fire caramelized to your specifics”. 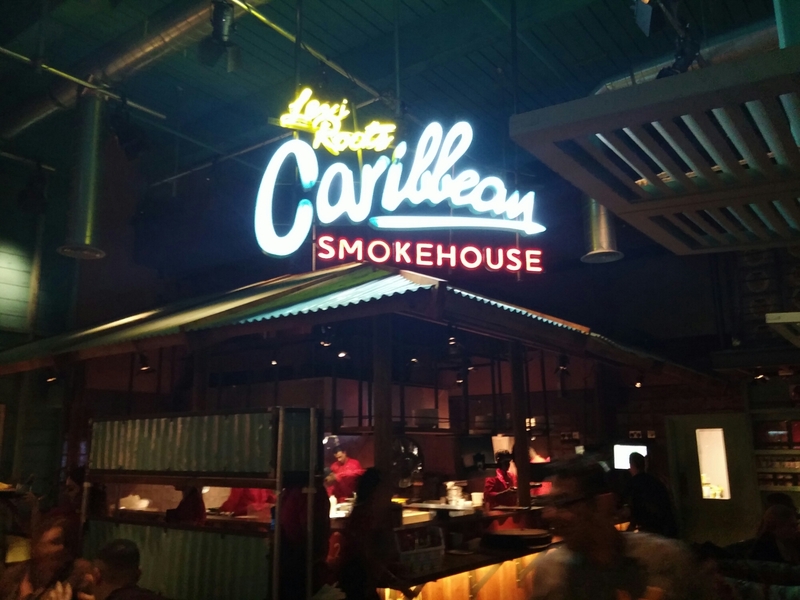 The whole ethos of the place is built around Levi Roots’ childhood love for music, food and colours, and that is exactly what you experience at Caribbean Smokehouse – a fusion of music with food and the sunshine of Jamaica, thus cementing his mantra of success with “put some music in your food”. Follow their halal food journey and see where it takes you. Remember it’s a Rasta’urant not a Restaurant. Disclaimer: We were invited to review.